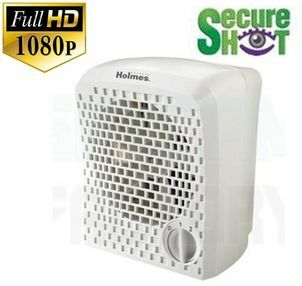 This Holmes personal air purifier functions normally but in fact is a SecureShot Full High Definition 1080P Personal Air Purifier Camera/DVR w/Night Vision. All recording are time/date stamped for professional security applications. It features Motion activated real time video that is recorded on a tiny SD card, hidden in a vent behind the filter. Every system includes an 8Gb SD card. Records color video by day, and B&W video at night EVEN IN TOTAL DARKNESS, thanks to our hidden array of totally invisible "no glow" IR Illuminators. Very covert! No "Tell Tale" SD Cards glaring out the back or suspicious looking out of place jacks. Motion activated real time Full High Definition (1080P) video. Video may be played back from the unit itself to your TV or SD card removed and played on your PC via the included SD USB card reader. IR remote control allows for arm/disarm, system parameter adjustments, and playback. Includes: Air purifier covert camcorder, remote control, 8Gb SD card, SD card reader, RCA playback cable, instruction manual. One year warranty and free lifetime tech support. HD Pre-Record: Motion activated DVR's take 2-3 seconds to start recording after motion is detected. If a subject is walking past the camera view quickly, they will likely be missed entirely. Pre-Record eliminates that possibility by adding 6 seconds of pre video to each motion activated event file before motion is triggered. Even fast moving subjects are captured on video, with seconds to spare. Now a standard feature on all SecureShot plug-in models.